It’s unfortunate that we’re not supposed to eat sugar anymore, because at this time of year I’m zesting citrus like mad and there’s nothing like a little (or a lot of) sugar to tame the delectable bitterness of orange and lemon peels. Think marmalade, think lemon-olive oil cake, think whole wheat quick bread with orange zest and brown sugar. Need more ideas? I loved this recent post from Food In Jars. This isn’t a recipe so much as a good idea: before the next time you peel or juice a (washed, organic) lemon or orange, scrub off the zest with a microplane first. Zest the fruit directly into a bowl to catch every drop of oil and essence from the peel. Add sugar. For this batch I added 1/2 c. granulated sugar to the zest of one orange and half a lemon. Mash it around to help the sugar absorb the flavor of the zest, then leave the bowl uncovered at room temperature for a day or two, stirring occasionally, until the zest is completely dry. Transfer to a sealed jar for storage. So far my favorite use is grinding the sugar in a mortar and pestle or food processor to use in my coffee or tea. (If you don’t grind it, you’ll end up with chewy little zest floaties; ask me how I know!) You can also use the sugar for flavor and decoration atop glazed citrus cakes or cookies, or to dunk strawberries, or sprinkled onto white chocolate-covered matzo for a Passover treat. And of course a jar of this sugar makes a handsome but inexpensive homemade gift. Any other ideas for using citrus zest or this citrus sugar? I have an ever-growing supply. This entry was posted in Baking, Desserts, DIY, Food, Preserving, Recipes, Vegan or Would-Be-Just-As-Good-Vegan and tagged lemons, oranges, preserving, sugar, zest on February 28, 2013 by emmycooks. Well, if sugar isn’t as palatable now, why not do the same thing with salt? I can only imagine how delicious citrus salt would be on a whole variety of things. Oh, but isn’t salt on the hit list too? :) But you’re so right–a flakey orange-infused salt on white fish with fennel? A sprinkle on black bean soup? I have to get on that! I was just thinking citrus salt too! Yes, I’ve been making citrus salt lately. I put it on my yellowtail crudo and it really made the dish, in my opinion. 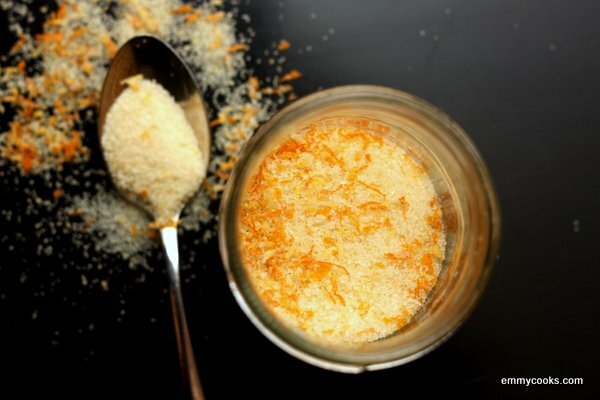 I do love the idea of this citrus sugar for all kinds of stuff. Great idea, Emmy! Another great use for lemon zest I just saw is a sauce for fish or vegetables with yogurt, lemon zest and garlic. Healthy too. I’ve never thought to freeze lemon zest–great idea! And I love the yogurt/zest/garlic/salt combo as well. The idea of using citrus sugar in coffee is really interesting–it brings to mind the little curl of lemon peel you get with your espresso at super-fancy (or I suppose Italian, as in “in Italy”) coffee places. There’s a coffee shop here that serves espresso with cinnamon, vanilla syrup and an orange twist–a fabulous dessert! Ooooh, citrus sugar and citrus salt! I am going to have to make both! I probably would use the salt more than the sugar. We don’t make a whole lot of citrus desserts, but I can imagine dipping strawberries in lemon sugar. And sprinkling lemon or orange salt (or even lime) on seafood! YUM! Thanks for the fabulous post! We love lime salt, so many uses. I’m pretty sure citrus sugar would find a good home here at our house! I’m thinking a little sprinkle on buttered toast, maybe with some cinnamon – a whole new cinnamon toast. Or perhaps in and/or on some simple shortbread cookies … also, might make a nice edge on a cocktail glass! Yum. Great idea Emmy. A fabulous idea, not only for all the possibilities of using the wonderfully ctrusy sugar in so many delicious ways, but also to promote a use-the-whole-food approach. Both frugal and also respectful of the bounty we’re so fortunate to enjoy. 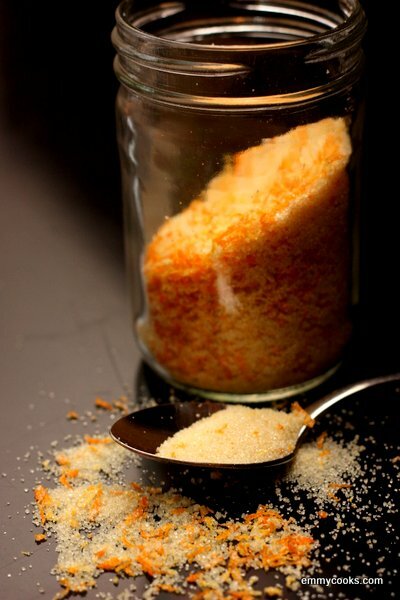 Love the idea of the citrus salt too – great to see how one great idea sparks more! As for sugar’s deleterious effects, education and moderation! Great idea and I love the smell of orange zest. FYI on these great ideas for citrus sugar and salt — do make sure your lemon, orange or lime is organic or at least unwaxed (if you’re buying from a store rather than going out in the citrus grove, it will only be unwaxed if it is organic). Conventional citrus is treated with wax containing fungicide to prevent mold… and it’s designed to penetrate the entire rind. Yum! I love lemon sugar, but have never tried combining other types of citrus zest with sugar or salt… I’ve also never made it in such a large quantity ahead of time, but that’s a good idea! Yum. This is a terrific idea, Emmy! I always feel a tweak of regret when I squeeze half an orange or half a lemon and chuck it with the peel intact. Fantastic idea Emmy!!! I’ve been making mint sugar (just grind up some mint with sugar in a mortar and pestle until it’s beautifully green… add in some more sugar if it becomes too wet) and sprinkling it on fresh mango, pineapple and strawberries. So, so good. Haven’t tried citrus sugar yet though. Love your blog by the way, this is my first visit! :) Thanks for sharing!